The Queen, 92, and Prince Philip, 97, were both spotted recently without their belts on. Last week, the Prince turned over his car in a horror road smash near the Queen's Sandringham Estate. It is illegal not to wear a seatbelt under UK law unless a doctor provides a medical exemption. Road safety campaigners have reacted in fury to the news that Land Rover turned off both Royals' seatbelt alarms. A source said Jaguar Land Rover was told to disable the beeping alarms on vehicles supplied to the Royals. "It's so that the driver doesn't have the continuous warning beeps if they don't wear a seatbelt," the source close to the company told The Sun. Britain's longest-serving monarch was seen arriving at a Women's Institute event on Thursday without a seatbelt along with her lady-in-waiting — but the driver was wearing his. Prince Philip was also spotted driving without a belt — just two days after his 4x4 was flipped on its side when he was blinded by the sunlight and collided with another vehicle. British Safety Council chairman Lawrence Waterman blasted the decision by the Royals. He said: "It's not as if it's onerous or difficult — and the law requires it. "Obviously these safety devices are a helpful reminder and I'm very disappointed as I do feel the Royals should be setting a better example. 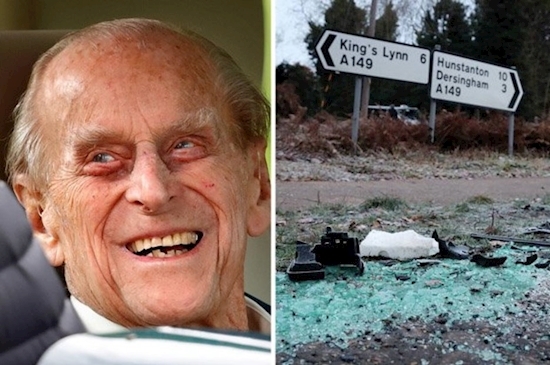 "Whether or not the device was working, Prince Philip should be wearing a seatbelt. "He's old enough to know what he should be doing and frankly I feel he's showing a disrespectful attitude to the rest of us." Joshua Harris, director of road safety charity Brake said: "Not wearing a seatbelt flies in the face of decades of evidence and puts your life at risk." Disabling the seatbelt warning feature isn't illegal and a car can still pass its MOT with it off. It comes after Daily Star Online reported Prince Philip was involved in another car crash in 1964. Daily Star Online has approached Buckingham Palace and Jaguar Land Rover for comment.